We are proud to announce the opening of the Waterloo Region's Jewish DVD Library. Anonymously dedicated in honour of Chaim ben Tzirl, for good health and mazel. 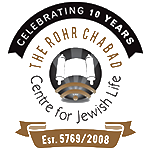 The Library is a partnership between Chabad and the community. All fees will be invested towards expanding the library. Click here for the current catalog. 1. Pay as you go - $7 per DVD. 2. Annual Membership - $36.00. Click here to sign up and note that it is for the Library. All DVDs must be returned within 7 days. Users may renew their lending period via email. No user may borrow more than 2 DVDs at once. In the event of permanent damage to a DVD, the user is responsible to pay for its replacement. A late fee of $1/day will be assessed if a DVD is not returned on time. All users must reap the benefits of easy access to Jewish DVDs by borrowing often and spreading the word!